The ubiquity of mobile devices has dramatically changed the landscape for restaurant advertising, particularly for Quick-Serve (QSR) and Fast Casual. No longer constrained to the desktop, digital advertisers have embraced the possibilities of mobile data and continue to do so—digital ad spend measured by Placed for QSR and Fast Casual increased by over 1,000% between 2014 and 2018. Read the full report here, or contact sales@placed.com to learn more. In the same way in which ad viewability was the hot topic issue these past 18 months, Placed anticipates location accuracy to enter into the headlines. Placed’s research found that on average the accuracy of exchange based locations were on average off by more than 4 city blocks! Additionally only 1% of bid request are accurate enough to identify store visits. potential for significant measurement bias to exist. The average accuracy of exchange-derived locations is over 4 New York City blocks. After filtering for location accuracy, only 1% of bid requests are useful for in-store measurement (based on a location accuracy < 50 meters). 80% of bid requests are made while people are in between visits—and most of the rest are made at home, limiting viable use of the data for determining store visitation or affinity. Exchange-derived locations are only present when the device owner is using the phone and browsing an app that serves ads, thus bid stream data over indexes on location data from Lodging, and Gyms & Fitness Centers– likely due to readily available wifi combined with extended time spent at a given business. Key retail categories such as Fashion, Professional Services (ex. Staples, OfficeMax), Sporting Goods and Computers & Electronics are under-represented in bid data. The skew toward a subset of commercial business categories creates a bias in exchange derived data that requires validation against first party data to ensure corrected weighting. Placed is excited to announce today that we are joining the Snap Inc. team! Over the past 12 months, Placed has measured more than $500 million in media spend to store visits, across thousands of campaigns and hundreds of partners, cementing Placed as the leader in location-based attribution. By partnering with Snap, we will do even more. Still working independently, Placed’s goal continues to be the adoption of a common yardstick that can measure the offline effectiveness of advertising across multiple platforms and publishers. Together, we believe we can drive much better results for advertisers and publishers. Black Friday has been a long-standing American pastime, one that creeps closer and closer into Thanksgiving every year. For many Americans, it is accompanied by images of people shoving and trampling each other to get their hands on the hottest discounts, giving a redefined meaning to the term “door-buster.” And, according to the NRF, nearly 102 million consumers shopped in brick-and-mortar stores over the Black Friday holiday weekend this November, where the retail advertising buildup beforehand represented a billion plus dollars. So, the decisive question remains—who were the retail winners and losers in the ultimate annual competition of reaching those 102 million consumers effectively? Placed and Kantar came together again to merge their intelligence and evaluate the amount of incremental store visits per dollar of advertising, measuring the success through the metric of ‘lift visits per ad dollar.’ This measure was then converted to an index scale, assigning an index of 100 to the highest lift visits per ad dollar and scaling all other values against it. This year’s analysis revealed that consumers are on the prowl for the latest and greatest electronics, particularly when it comes to Black Friday deals. Best Buy came away as the winner: with $24.2 million of ad expenditures, Best Buy experienced a 125% lift in store visits, obtaining the top efficiency index of 100. In second place behind Best Buy comes JC Penney with an efficiency index of 75, claiming the top spot for the department store and mass merchandiser category. And when it came to the battle of Walmart vs. Target, it was pretty close: Walmart experienced an efficiency index of 65, with Target on Walmart’s tail with an index of 63. The digital cousin of Black Friday, Cyber Monday has stolen some of the holiday shopping spotlight. 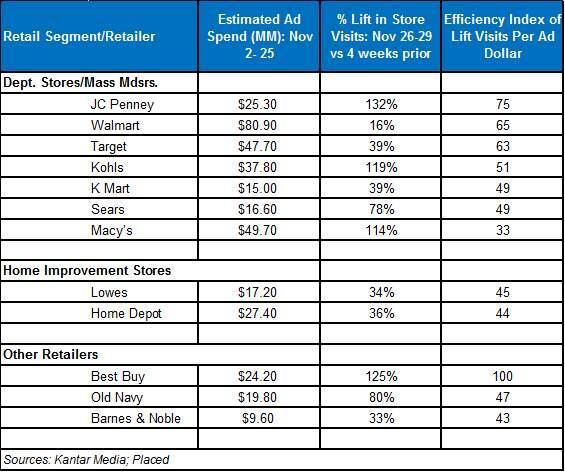 Regardless, the 2015 findings highlight that pre-Thanksgiving advertising spend remains not just important, but actually successful in generating foot traffic—proving the reality of holiday retail: Black Friday isn’t dead, it’s just different. Download the full report here to learn more. The November Placed 100 was released today highlighting last month’s big movers in terms of foot traffic. November is always a critical month given Black Friday and the holiday shopping crush. Not surprisingly, many of the businesses with the biggest jump in the store visit rank were retailers. Leading the charge was American Eagle Outfitters, who not only cracked the top 100 for the first time, but did so by moving up 17 positions to number 84. 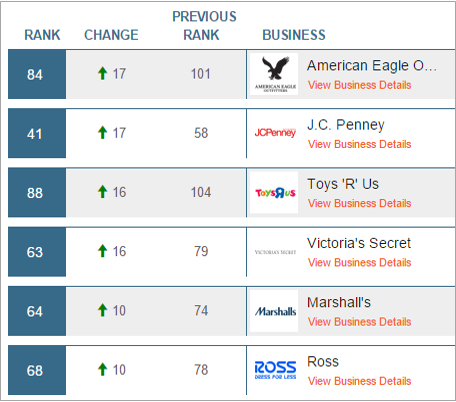 A host of other fashion retailers were also big movers including JC Penny (+17), Victoria’s Secret (+16), Marshall’s, Ross and Old Navy. Toys also made a big push as Toys ‘R’ Us was up 16 spots, also cracking the top 100 for the first time. Foot traffic to stores selling electronics, the ever-popular holiday gift, were up across the board, led by Best Buy (+8), GameStop (+7), and mobile phone providers T-Mobile, Verizon and Sprint. Dropping in the store visit rankings this month were quick serve restaurants like Dairy Queen (-15), KFC (-10), and Domino’s Pizza (-9). Thanksgiving dinner this year, apparently was all home cooking. Travel related business such as gas stations and hotels saw declines in foot traffic, following the end of the busy summer travel months. View the full Placed 100 to see the other big movers last month.